We are often asked how you can identify your dog while it is "In Training" to become a Service Dog. One obvious way is to purchase a vest with "In Training" patches on it. Purchasing that type of vest will unfortunately require you to re-purchase without the words "In Training" on it so your access rights are not limited. 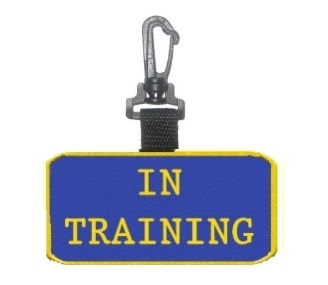 www.WorkingServiceDog.com has a better idea, we suggest an "In Training" clip on patch tag that easily clips on and off of the vest as needed. This will allow you to purchase only one service dog vest and identify your dog as it is training. This patch tag easily clips on and off of your dogs vest, collar or leash.